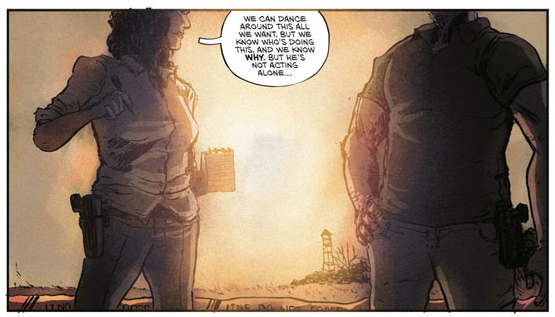 Z2 Comics keeps it coming with Indoctrination, an apocalyptic political thriller in the vein of the first season of True Detective mixed with the scary realization that people are coerced into believing what groups are capable of. Writer Michael Moreci (Roche Limit, Hoax Hunters, Dawn of the Planet of the Apes) and artist Matt Battaglia (Roche Limit) join us for a spin on the Cosmic Treadmill in advance of the June launch. The book is already getting major attention from some True Detective fan sites, but as the following interview will reveal, there is more to Indoctrination, as our heroes face a far more sinister force. Between death cults and sleeper cells, Indoctrination tackles fear, at a time when the world is growing tired of threats from inside and outside forces. FOG! : What can readers expect from Indoctrination? Matt Battaglia: Readers can expect a thoughtful thriller in the vein of classic 70s cinema, but wrestling with the potent issues of our times. 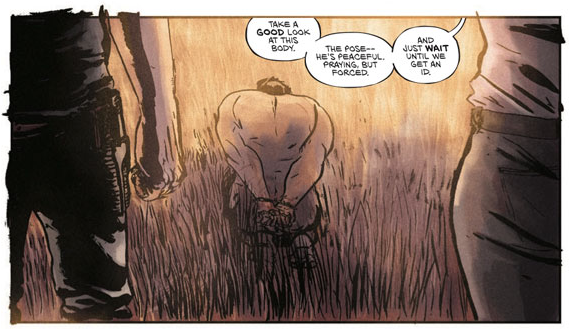 Michael Moreci: What Matt said. I think the series reminds me a lot of Hannibal, in that it’s slow, methodical, and the underlying developments are so unsettling that it makes everything else all the more frightening. We want to make a book that gets readers at their core with intense, thought-provoking, and chilling horror and crime. It’s very unique in a lot of ways, in a lot of GOOD ways, and there’s never been a better time for it to hit—in regard to the current political climate and the comics climate. Issue #1 has a lot of crime-drama elements but also hints of a bigger picture related to terrorism and getting radicalized into extreme belief systems. What made you want to make a comic about such heavy issues? MB: I like to think the two of us are pretty ‘plugged in’ to what’s going on in our political climate, and because of that I’m more interested in discussing and looking at larger topics. Look at the events in Brussels – the general discussion surrounding these terrorist attacks tends to drop after a week and we’ve gone nowhere. Hopefully this book at least continues to stoke a discussion about what is America’s role in this fight and what drives people to commit such evil acts. MM: As a writer, I’m trained to write about what keeps me up at night, and more and more, what’s really disturbed me is the rise of radicalization in the US and around the world. I mean, look at the political primaries. We kind get away from radical thinking. Trump is the obvious guilty party, as his proposed polices and practices are so out of bounds and, let’s be honest, kind of crazy and a touch racist—but what’s scary is that he’s reaching a lot of people. Bernie’s not immune either—things like free college is so unthinkable, but he keeps pushing it. I wouldn’t say that’s radical, per se, but it certainly a policy that isn’t founded in reality. Point being—never has radical thinking become so normalized. And the more that happens, the more we’re seeing radical action, which is most times violent. And this problem is not going to get better any time soon. We’re in a pretty frightening time in history, both in the US and around the world, and I’m not sure how it’s going to get better. I’m compelled, at times, to capture the world as I see it, and hopefully Indoctrination does justice to this slice of our contemporary world. Indoctrination seems to be about fear from almost every main character’s point of view. MB: Precisely – everyone’s in some stage of gaining or losing faith — in Country, God, themselves, their family. MM: For sure. Like Matt said, everyone is dealing with being indoctrinated in one form or other. We’re all indoctrinated, by our family, friends, church, school, whatever. And that’s not a bad thing. But when the indoctrination gets radical or out of control, that’s when things go bad. All our characters have experienced this—some are aware, some aren’t, but they’re dealing with having ideologies imposed on them in some way. The look of the book is very cinematic, and I did feel as if I was in a television show at times. Is the goal to adapt Indoctrination to another media? MB: I take that as quite a compliment, thanks, and I’d be thrilled to see it adapted at some point. Currently our goal is to put out the best comic we can — everything else we’ll take in stride. MM: I’ve dipped my toe in film and TV and continue to do so. I love those mediums as much as I love comics, and much of Indoctrination was inspired by TV shows like Hannibal, Homeland, and True Detective, and movies like Sicario. There’s not many comics out there doing what we’re doing. But, that said, the goal is to make a great comic, Period. My dedication is to the medium, always. How many issues are planned for Indoctrination? What’s it like working with Z2 Comics? MM: We couldn’t be happier. This is a great crew with a fantastic vision, and we’re both thrilled to be part of it. Where is the best place to keep up with your books or learn more about Indoctrination? 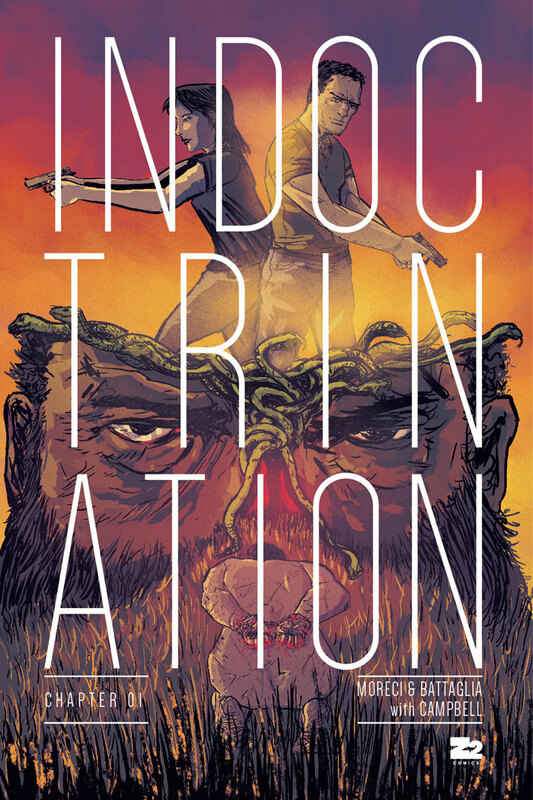 MB: At the site, indoctrinationcomic.com, we’d really appreciate folks signing up for our email list which is the best way to keep up to date, I’ll also be selling prints there too and some other fun stuff. 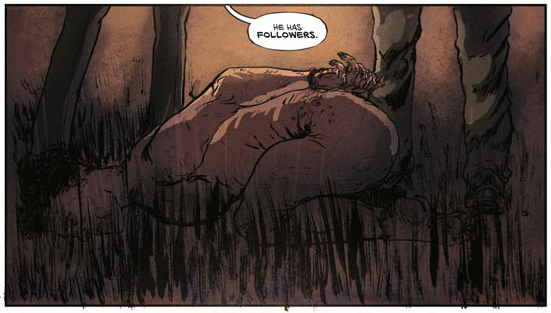 MM: You can find me on Twitter @michaelmoreci or my website, michael-moreci.squarespace.com. FOG! Exclusive: 'American Assassin' One Sheet by Matt Taylor!